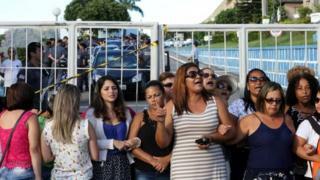 Wives and other relatives of police in the Brazilian state of Espirito Santo have defied a deal aimed at ending a week-long strike. They say they were not included in negotiations to end the action over pay. On Friday, state officials threatened to charge more than 700 police with rebellion. The strike has left a security vacuum, causing a wave of violence that has reportedly left 137 people dead. Wives and relatives of the officers have been blockading stations because Brazil's military police, who carry out street patrols, are barred by law from going on strike. They face two years in prison if convicted. Brazil's Defence Minister, Raul Jungmann who was visiting the state, said 3,000 troops drafted in to deal with state security would stay for as long as was needed. He appealed to the women protesters to allow the police to leave police stations. "I ask these police wives to not lead your husbands, your partners into a trap. There is no alternative and these actions are not going to lead anywhere." Similar protests were staged in Rio de Janeiro but most police personnel there did not stop patrols. Image caption Mourners gathered earlier this week at the funeral of a policeman killed during the violence in Espirito Santo. Brazil's President Michel Temer addressed the crisis for the first time on Friday calling the strike "illegal" and saying: "The right to protest cannot take the Brazilian people hostage." The strike paralysed many parts of Espirito Santo with local officials closing schools, clinics and public transport, while shops and businesses remained shuttered. By Saturday, buses which had stopped running because of concerns that they might be wrecked, had gradually started running again. In Rio de Janeiro, which has been struggling to pay public sector salaries, family members of police officers organised similar strikes at several police stations but the protest did not stop police patrols in most areas. Similar protests were attempted in the northern state of Para, in the capital, Belem. Espirito Santo is one of several Brazilian states struggling with a budget crisis that is crippling public services. Military police salaries there are the lowest of all 27 Brazilian states.